I had been given some 1/6000th ships to paint, those mentioned in 1/6000th Ship Painting and 1/6000th Ship Painting – Part 1 here at the Hole. I mentioned I was going to write up a step-by-step process of painting these vessels, especially as it was the first time I had painted 1/6000th scale vessels. I also wanted to explore techniques, share some information and be able to provide a warning. A warning? Well, yes. The warning is that carton cutters are very sharp – or should I say VERY sharp. Most wargamers who paint their own figures have the odd scar or five on their fingers from small cuts with sharp knives when trimming figures. I am no different. However, this time I have a slightly larger scar caused mostly by my own carelessness with a carton cutter (the type of knife I never use for the task I was undertaking but which I was using because I was too lazy to get off my fat a*** and go to the other room and get the slightly blunter knife that I normally use for that task). More about that when it occurs in the painting process. So, 35 ships in all to paint. Allowing for time out to watch football games on the TV, do the shopping and other domestic chores, I painted these over the space of about 10 days. I took my time painting them as I was pondering the best approach to take on this, for me, new scale as well as considering how best to handle the sea bases and the labelling. Now I know I could do 35 vessels like this across about 3 nights – maybe less – spending between 5 and 10 hours in total on them. The first task I did was to research the colours of the vessels as well a have a look at pictures of them to get a feel for what was located where on the vessels. I’ll talk about the colours specifically when I discuss the painting of each fleet in upcoming posts to the Hole. As for preparing the models for painting, I took the models from their packets, trimmed any excess flash or mould lines (which is another reason for looking at some old pictures if you can find them as that makes sure you do not trim off some detail you thought was flash). 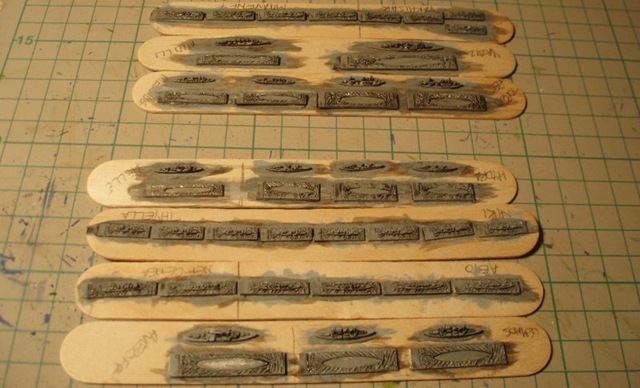 The models were then glued to tongue depressors (paddle-pop or pop sticks work just as well for this), the tongue depressors were then labelled with the ship class name to make identification of each ship easier throughout the painting and labelling process. The tongue depressors, glue and small sized vessels are also the reason I can say that carton cutters are very sharp. The glue I use for this process is generally a fairly brittle sort of glue – something like, in Australia, regular Tarzan’s Grip, or a PVA “white” glue also works as I just want to tack the models down but also be able to get them off the stick again after painting ((I’ve found that double-sided sticky tape generally does not grip the figures or ships well enough when painting although others have found that method of tacking the ships down quite effective)). After the trimming and gluing process, I then undercoated the vessels. 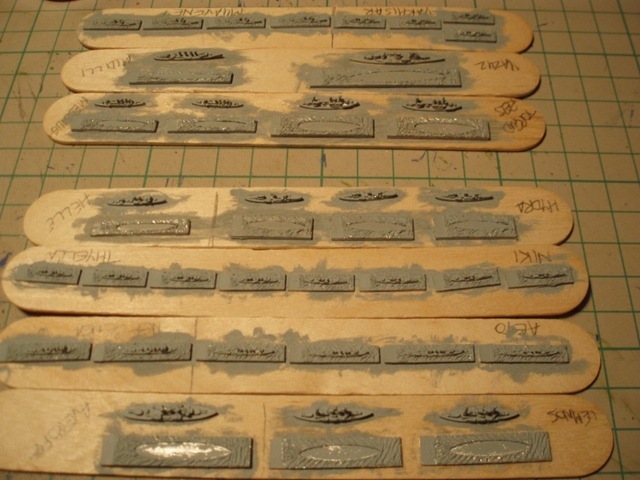 There are many methods and styles of painting wargame figures and model vessels. Some start on a white undercoat and use many shades for depth and variation, others start on a black undercoat and use layers of brushing to achieve depth and shadows whilst still other methods start by undercoating the figure or model in the basic colour it will be. All provide slightly different results that look slightly better or slightly worse depending in the eye, taste and whim of the viewer. For these models however, given their small size and the fact that I do need to get to an optometrist for a eye check up and new glasses, I opted to undercoat the vessels in a light grey. Throughout this series of posts , I will illustrate the step (or the result of two steps) with photos plus I will identify the paints and colours I used. I usually use acrylic paints for a number of reasons that I won’t go into here and my paints are normally Vallejo and Citadel. I had just picked up some of the newer Citadel Foundation colours and washes and wanted to try them out. John’s vessels were the first opportunity I had to do this ((I should note that the advantage of trying out a new paint or technique is that if you screw it up, you can always paint over it in a better style so there is not too much risk in trying new styles and techniques)). I undercoated all the ships in Citadel Foundation Colour – Astronomican Grey (yes, the spelling of that is correct – they are after all a series of paints designed for painting fantasy figures). Once the undercoat was dry I think washed all the vessels with the Citadel Budab Black Wash. This darkens the crevices in the vessels and bases for what is to come as well as makes it easier for this old wargamer to see the detail he is painting. As paint reflects light of the colour of the pigment in the paint, and as the pigment consists of very small particles of pigment suspended in a medium of some sort, then paint often does not have 100% opacity. Think of house paint and painting a room – you normally use two coats of colour as after the first coat you can still see what is underneath the paint. Model paints are no different so the black wash on the sea base, for example, will darken the next colour that is painted on just a little bit in the lower troughs. You’ll see the effect later. The picture below is of both fleets after undercoating and the first wash. 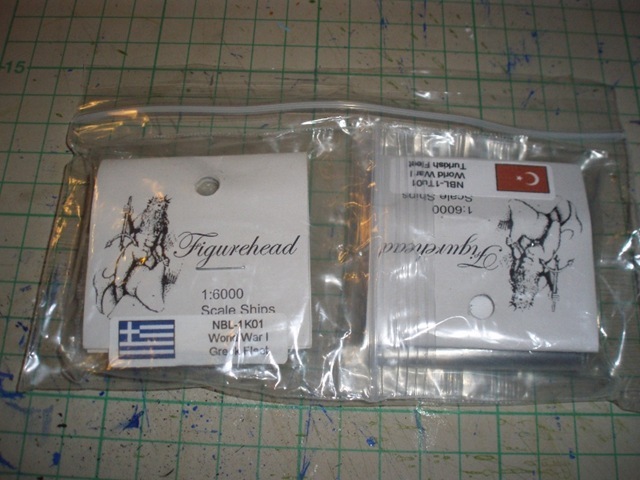 The next post will look at painting the Greeks. 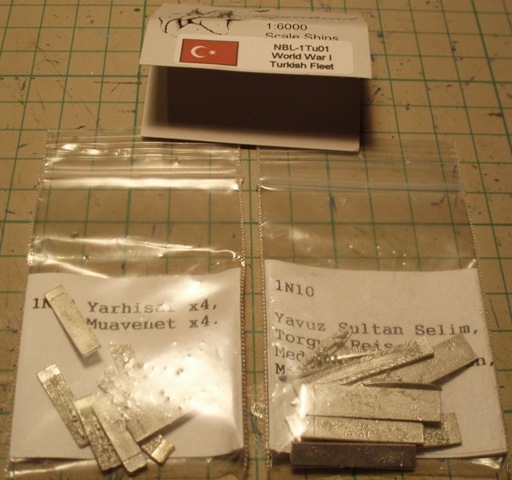 After that, a separate post will discuss painting the Turks. In the final post I’ll talk about labelling the vessels and then you’ll be able to see both fleets completed.I should add one final note here. Where you see a grid behind or underneath the vessels, the grid is from my cutting boards and the squares are all 1cm by 1cm.